A proposed recreational pier on the Dayton riverfront received verbal approval from city council on Tuesday before a lengthier discussion emerged about the city's finances. One of the organizers of the pier effort, first reported by The River City News in July, presented a master plan to the city council, something she said woud be required by the Army Corps of Engineers. Cincinnati-based design firm KZF could perform the work for $19,500, which would include a project kickoff, evaluation of existing conditions at a site, community visioning, a conceptual master plan, a master plan & design review, and the publishing of a final plan. "This is a complete detailed list of what we can expect for that money," Catherine Hamilton-Hicks said. The work would not include design of the actual pier. "This isn't going to happen overnight but this is the first step we have to take to make this happen." The city council voted unanimously to endorse the project, though no funds were allocated. Another firm, Woolpert, will also be solicited for a master plan concept and price. "If we can allocate that money for this project, I think we'd be in a great position," Hamilton-Hicks said. "It's going to change our whole front porch to the city." City Administrator Michael Giffen said that whichever firm is eventually hired, it would serve as a middle man between the city and the Army Corps of Engineers (COE). Picking a location, yet undecided, could also bring a number of unforeseen factors. In Maysville, where a recreational pier serves as the inspiration to the Dayton group, a mussel study had to be conducted, Giffen used as an example. DCI, the developer behind the upscale riverfront housing project currently underway, could also be a potential partner in the proposed pier's construction. That concerns City Councilman Virgil Boruske. "The developer in the next phase still has to put a city building in," Boruske said. "I don't know how much we can go to the developer." Dayton conducts its city council meetings at the Board of Education building after it was determined that the current city building is too small to accommodate the crowds. "We have to start with a commitment and start with a game plan," Mayor Ken Rankle said. "I think the pier would be a great asset to the whole community." "This shows that we're serious," Hamilton-Hicks said of the council vote. Giffen explained that as the project begins its search for grant monies, having a master plan will help. 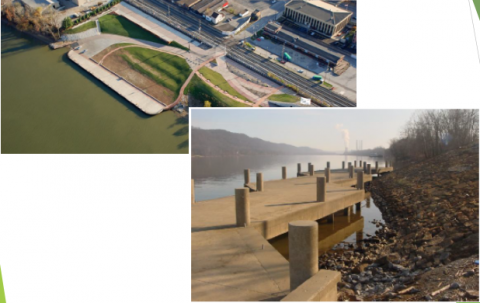 Mayor Rankle also thinks that having the pier installed would better guarantee Dayton's inclusion in the Riverfront Commons project, a recreational riverfront development that will eventually stretch across all the Northern Kentucky River Cities spearheaded by Southbank Partners. "I personally think the walk will go to the Bellevue Beach Park and then stop and then maybe come up and go through some alley way," Rankle said. "I think we're going to have to dig our heels in to get that connected the way it should be." City Councilman Jerry Gifford said that having a pier on the riverfront would harken back to the old days of Tacoma Park. "How could it be a negative?," he asked. Councilman Bill Burns expressed concern over the future homeowners and their million-dollar riverfront houses and whether they would want a public pier near them. "I'm not against it. I want to get DCI's buy-in," he said. To balance the 2014-15 fiscal year budget, Dayton approved moving more than $300,000 from its surplus funds to its general fund. There are only so many more times that can happen," Rankle said. "We've got to come up with some sort of game plan to raise money and I don't know what that answer is," Rankle said. Bellevue-Dayton Fire Chief Michael Auteri detailed for council how much of the department's fleet is aged and in need of replacement. In the three years he's been on the job, Auteri has never seen a plan to replace any of the vehicles, he said. A ladder truck is 22-years old and should be replaced after fifteen or twenty. Two engines are going on 19-years. Bellevue-Dayton is an independent fire department governed by a board appointed by both cities' councils. "I'm looking at next year with the possibility of the fire department wanting (more funds allocated to it) and right off the bat we're looking at basically $136,000 or $140,000 that we don't have right now," Rankle said. "The surplus is only going to last so long, so I think the finance committee or the whole council has to get together to come up with a game plan." Nobody likes higher taxes. We can't take this type of money out of our surplus every year because it won't take long for that surplus to be gone." Boruske, chairman of the city's finance committee, said more meetings would be scheduled. The fire board, where Boruske is also chair, meets next on August 20 at the Dayton Board of Education building at 6 p.m.